Pets can be used as battle partners. If players wish to they can choose to release their Pets at any point to gain more space for new Pets. Pets can be enhanced and can even participate in the Colosseum event. 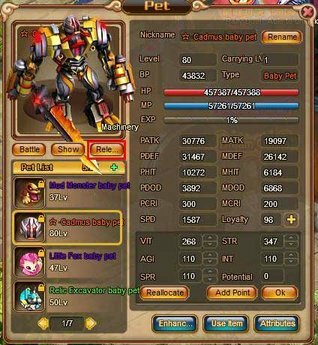 These Pets can come in different grades which determine their quality and stats, which are indicated by their colors. In addition Pets come in different categories: animal, plant, machinery, dragon, doll and elf. Pets come with many different stats and abilities that determine their usefulness and roles on the battlefield. There are also a large variety of skills that Pets can gain. Pets can be obtained through various means such as capturing them or obtaining them from dungeons and events. Players have a chance to obtain a Pet while encountering wild monsters and attempting to catch them. After clearing dungeons players can flip cards for a chance to gain boss pets. Finally dragon Pet eggs can be obtained from the Ancient Forbidden Path.